October 9, 1916, Denmark's embryonic submarine arm suffered a serious accident, when the submarine DYKKEREN, during a practice dive near Tårbæk Reef, was rammed by the Norwegian steamer VESLA. On October 9, 1916 the submarine DYKKEREN, commanded by Lieutenant Svend Aage Christiansen, left the Naval Dockyard in Copenhagen. Outside the harbor in Copenhagen, the submarine set a northerly course, towards Tårbæk Reef ("Tårbæk Rev" in Danish). The sub and its nine men crew had, unknowingly, started out on what was to become the subs last cruise. The submarine DYKKEREN was the Royal Danish Navy’s first submarine. 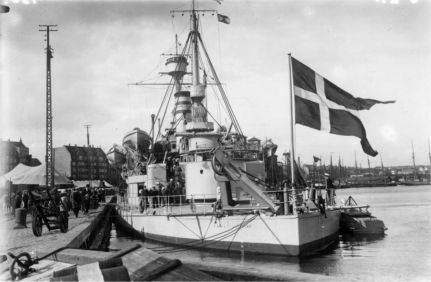 It was built for the Danish navy by the Italian shipyard Fiat San Giorgio at La Spezia in 1908/09, and after it was towed to Denmark, and commissioned into the Royal Danish Navy on September 29, 1909. Unlike the navy’s later subs, which were equipped with diesel engines, the DYKKEREN was only equipped with electrical engines. This meant that the sub had a limited endurance as, initially, its batteries could only be recharged with an auxiliary power plant at the Royal Dockyard. In 1916 the sub was therefore mainly employed as a training ship, with very limited combat duties, since its main role was the education of new submarine sailors. At approx. 1330 hours the sub reached the training area near Tårbæk Reef just north of Copenhagen, and the sub was readied for a dive according to routine. From the accompanying vessel, the torpedo recovery vessel SLEIPNER, the crew was able to watch the preparations. Back in the early days of submarines, with their rudimentary and somewhat experimental technology, whenever a submarine was to submerge to engage in underwater cruising, a surface vessel usually accompanied the submarine to act as a tender, to render assistance as needed. waves of the Sound covered the sub, as it dove below the surface. Soon thereafter, only the prescribed signals displayed by SLEIPNER disclosed that a submarine was concealed beneath the waves. The submarine had only been submerged for a short while, when the crew onboard the SLEIPNER observed a large steamer, heading for the place where the submarine had submerged. 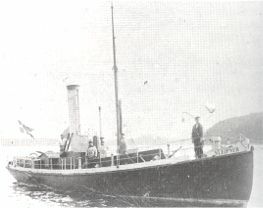 SLEIPNER used its steam-whistle in the attempt to warn the unknown ship, which later turned out to be the Norwegian steamer S/S VESLA from Bergen, but apparently the steamer maintained course and speed. SLEIPNER now began blowing short blasts with its steam whistle, which is the international danger signal at sea. VESLA, which now saw the imminent danger, ordered all reverse full on her engines – but it was too late. Shortly afterwards the stern of the steamer was lifted out of the water, when the ship apparently hit something beneath the surface! The DYKKEREN's submariners heard the grating sound of the Norwegian steamer's hull striking the sub, which heeled violently. DYKKEREN had been struck abaft the after hatch. Water gushed through DYKKEREN's punctured hull, progressively flooding the engine room, and DYKKEREN quickly trimmed down by her stern. The CO, Lieutenant Svend Aage Christiansen, acted like a professional sub-mariner. He immediately gave the order to blow the main tanks and at the same time tried to release the submarine’s drop keel. The purpose of this was clearly to bring the submarine back to the surface. But the attempt to avert the catastrophe was in vain, and in a cascade of bubbles the submarine settled on the bottom at a depth of approx. ten meters and with a small list. It was now a few minutes past two in the afternoon. SLEIPNER immediately sounded the alarm by sailing over to the anchored station-ship at Taarbaek Reef, the gunboat GULDBORGSUND. From here they were able to signal the naval high command in Copenhagen. By coincident one of the navy’s divers was aboard the GULDBORGSUND. - And he was not just any diver. Commander, Baron Niels Juel-Brockdorff, was not only a very experienced diver, but had also previously served as the Commanding Officer of the DYKKEREN. 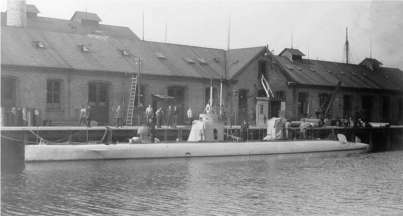 Juel-Brockdorff was CO of the navy’s newest submarine, TRITON, which was at the time undergoing an overhaul at the Naval Dockyard. He had, therefore, chosen this particular day to pay a visit to the CO of the GULDBORGSUND, Commander Hermann Ewald, who was married to Juel-Brockdorff's wife’s sister. When SLEIPNER reached the gunboat, Juel-Brockdorff went onboard to see if he could be of any assistance. While the boat made for the buoy, which marked the place, where the submarine had dived, he was dressed in a diving suit and readied for an immediate dive. On the way to the spot, they suddenly observed that three of the DYKKEREN’s crewmen surfaced. They had managed to escape through the subs conning tower. 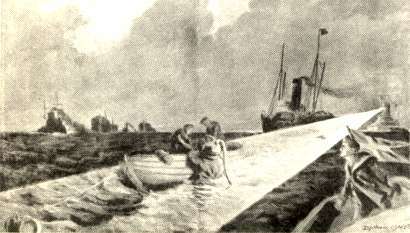 The three men were quickly picked up by a boat from the VESLA. They told that the CO, Lieutenant Svend Aage Christiansen, were still inside the subs conning tower. It was now half past two. DYKKEREN had been supplied with twelve life jackets equipped with oxygen and breathing gear. The breathing gear on two of these life jackets were inoperative, while a further four of the life jackets were inaccessible in the flooded compartment. So, only six functional oxygen breathing devices were available for the nine men still trapped inside the sub. The trapped submariners quickly decided that the three men without oxygen gear should, as quickly as possible, attempt to escape by exiting the sub through its conning tower. The CO, who had breathing gear, was to assist in the escape attempt. The plan was that all nine were to try to escape through the conning tower, with the CO as the last man to leave the sub. Aboard the SLEIPNER it was decided to send the diver, Niels Juel-Brockdorff, down to the sub, to try to establish contact with the Lieutenant in the conning tower. Juel-Brockdorff later spoke of the attempt: "I landed on the deck of the sub, but since it was listing, I had to crawl very carefully towards the conning tower. Unfortunately I slipped and before I could regain my foothold, I fell to the floor of the sea." He continues: "With three yanks in the linking me to the surface, I was able to signal that I wanted them to haul me back up; another attempt to reach the sub also failed, when the current proved too strong, and I had to abandon the attempt. The accident happened at approx. 1300-hours, and since it took about one hour before I reached the sub, it is more than doubtful that the captain was still alive at this time." It soon proved impossible for the five crewmembers still inside the sub to remain in the aft part. The saltwater had reached the batteries, which caused these to start generating chlorine gas. The crew therefore chose to move into the torpedo room, but through the port-hole in the door, they could see how the water continued to raise inside the rest of the sub. The training and discipline, which the men had acquired during their training, was now to face the ultimate test. It was to be many hours of uncertainty before they again were back at the surface breathing fresh air. The Royal Danish Navy had already before this accident made plans for an incident like this, and they had therefore already made a contract with the salvage company Svitzer concerning assistance during such submarine-accidents. A little less than three hours after the accident Svitzers' salvage vessel KATTEGAT anchored above the sunken sub and the salvage operation began. The first part of the operation was the launching of a diver, who attached an air hose to the sub. This made it possible to pump fresh air into the trapped men. The next step was fastening of a steel wire to the mounting, placed in the stern of the DYKKEREN. While the experienced divers from Svitzer began the salvage of the sub, Juel-Brockdorff was once again sent down to the sub in the attempt to make contact with the crew inside the sub. Using a hammer, he tried to send Morse-signals to the trapped men. He later told: "I was standing on the bottom, and the signaling proceeded like during a normal school exercise. – Engineer Andersen and I knew the alphabet by heart, and his answers were very easy to understand, and that comforted both him and me. – It was a very nice experience to be able to climb back up to the surface, and tell the commanding officer of the Command Ship OLFERT FISCHER, that the five remaining men were still okay”. Juel-Brockdorff was several times during the remaining of the day sent down to the submarine. He maintained contact with the crew and kept them informed about the process of the salvage operation. When the wires had been fastened to the hull, the KATTEGAT very slowly began raising the submarine, while they continued to pump fresh air into the sub. Finally around 2300 hours the forward part of the submarine once again reached the surface of the Sound. It was, however, not quite possible to raise the sub so high above the water that the forward hatch was clear of the water. It was therefore necessary to place sacks filled with sawdust around the hatch before it was opened. After having been trapped for almost nine hours inside the submarine, the remaining five crewmembers were finally able to leave the damaged sub. After a quick breath of fresh air, the men were brought aboard the ship, where hot coffee and brandy awaited them. A boat sailed to the submarines conning tower, which was now also once again above the water. Here the boat crew found and removed the body of Lieutenant Christiansen, who had died during the escape of the first three crewmembers. He had remained on his post and had given his life in order to save the rest of his crew. A torpedo boat with the naval ensign on half mast transported the body of the Commanding Officer, together with the rest of the surviving crew back to the Royal Dockyard. Due to bad weather it was decided once again to return the DYKKEREN to the sea floor, now where the crew had been rescued. A few days later, the sub was salvaged and brought back to the Royal Dockyard. But here it was decided that the DYKKEREN was a constructive total loss - too severely damaged to make its repair cost-effective, and the sub was decommissioned and finally, in 1918, stricken from the navy. The DYKKEREN’s previous CO, Commander Niels Juel-Brockdorff, who had been the first to reach the sunken sub, and who through most of the salvage-operation had maintained contact to the trapped crew, received praise for his effort. Following the conclusion of the crew's rescue from the sunken submarine DYKKEREN, the naval high command wants to commend the Commander for his assistance during this operation. Your work is judged to have substantially helped achieve the result. On October 18, 1916, Commander, baron Niels Juel-Brockdorff was further-more awarded the Order "Officer of the Order of the Dannebroge", as a further official commendation of his work. The escape made from the submarine DYKKEREN was the first ever made, and it made international sensation and was mentioned in most naval magazines of that time. The collision led to a number of changes in the Danish subs, and some of the navy's large vessels were equipped with a large crane of the aft deck. This crane would make it possible for the ship to assist if another accident were to happen. Luckily no such occasion was to arise again.